In a survey of of Ireland’s rivers, beaches and harbours, Lanesboro was one of only four areas nationwide deemed to be “Clean to European Norms”. 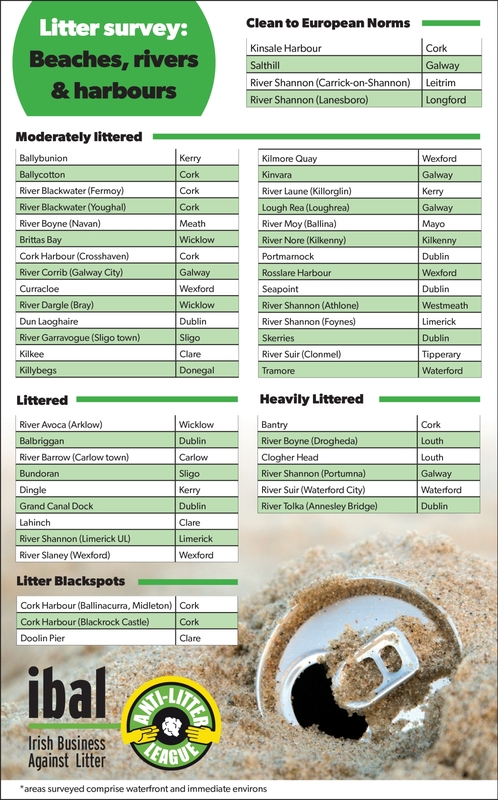 The first nationwide survey by business group Irish Business Against Litter (IBAL) of Ireland’s rivers, beaches and harbours has revealed that the River Shannon at Portumna in Galway is ‘heavily littered’ and is deemed ‘littered’ at the University of Limerick. The study, carried out by An Taisce, showed only 4 of 50 areas surveyed were deemed “Clean to European Norms”, among them the Shannon at Carrick on Shannon and Lanesboro. IBAL has been publishing litter surveys since 2002 as part of its Anti-Litter League programme, which has helped bring about a spectacular shift in litter levels. 16 years ago, less than 10% of the towns surveyed were deemed ‘Clean’. The most recent report shows three-quarters of towns attaining Clean status. The most common forms of litter found by the assessors were cigarette butts, sweet wrappers, plastic bottles and cans. Worldwide, billions of kilos of disgarded plastic can be found in swirling convergences in the oceans, making up about 40 percent of the world's ocean surfaces. For every foot of coastline in the world, the equivalent of 5 grocery bags filled with plastic ends up in our oceans each year. By 2050, it is estimated that there will be more plastic in the oceans than fish.